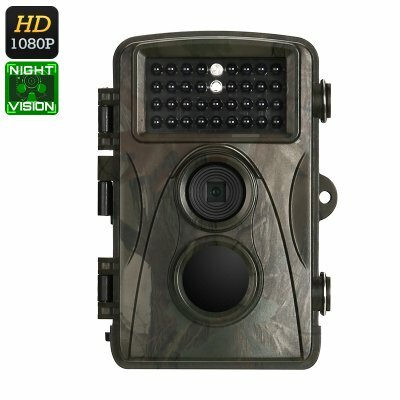 Successfully Added 1080p Trail Camera - Full-HD Video, 12MP Images, 2.4-Inch Display, 8 Months Standby, IR Cut, Night Vision, 110-Degree Lens, IP56 to your Shopping Cart. This Full-HD game camera allows you to quietly capture stunning 12MP pictures and 1080p video of animals out in the wild. Making beautiful nature photographs and video and scouting out an area before hunting season has never been so easy. Simply attach the trail camera to a tree and, thanks to its 8 months standby time, you’ll be able to scout and analyze animal behavior throughout the year without disturbing them. Knowing the living patterns and whereabouts of these animals provides you with valuable information that can be used to find the best hunting locations for the upcoming season without ever disturbing the animal population. Whether you simply like to shoot photographs of nature, or scout out an area for hunting purposes – this 1080p trail camera is sure to meet all your demands. The high-end camera that has been integrated within this game camera features a 5MP CMOS sensor. Thanks to this, you’ll be able to shoot detailed pictures and photographs throughout the year. It furthermore features an 110-degree viewing angle that provides you with a wide range of view – ensuring that no movement will ever stay uncaptured. With its motion detection sensors and 25-meter night vision capabilities, you’ll be able to spot animals at any time of the day. By allowing you to add a time stamp to the taken video and photographs, you’ll always know the exact date and time of when an animal has passed your game camera. Featuring a trigger time of merely 0.6 seconds, this trail camera snaps instant photographs of anything that passes its way. Coming with a sophisticated 2.4-Inch LCD display, it allows you to instantly watch back pictures and recordings in great resolution. Thanks to its SD card slot that supports up to 32GB, you can be assured this trail camera holds enough storage for you to keep all the captured images and video. With its tough IP56 design, this 1080p game camera can be used in nearly all weather conditions. From now on you’ll always know the patterns and behavior of your upcoming game – guaranteeing that you’ll never again have to return empty-handed during hunting season. This 1080p trail camera comes with a 12 months warranty, brought to you by the leader in electronic devices as well as wholesale electronic gadgets..